The Heritage range of stair parts provide exceptional luxurious quality stairs with grand sweeping handrails and beautifully turned spindles and newels. The over-the-post system provides an unbroken line across the stair bannister, giving that additional touch of elegance. Also known as a continuous handrail system, the design involves connecting lengths of handrail to the fittings and up-ramps, also called an up-easing (small curved sections of connector rail). This allows the handrail to flow over the tops of the newels. The connecting parts have a profile to exactly match the handrail to create a seamless finish. 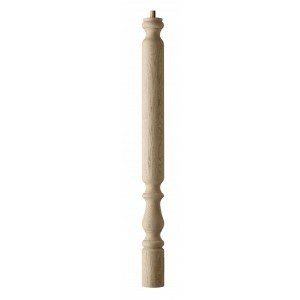 This over the post range of stair parts is available with grand 55mm spindles and generously sized 110mm newel post turnings, ideal for larger staircases and hallways. These parts are crafted to meet the highest standards, all our timber stair parts in the Heritage collection are manufactured with luxurious White Oak by experienced carpenters.